*Katharina Frei* - Kreatives Sammelsurium: Good luck for your birthday! Wohooo, heute wurde ich zur Patentante!!! Ihr merkt wohl, dass ich richtig aufgeregt bin :) Meine kleine Nichte Isabella wurde mit 2600 g und 46 cm heute geboren. Was für ein besonderer Tag! I used Whiff of Joy's german party sentiments "Good luck for your birthday" and framed them with Tattered Angels Glimmer Chips chipboard. The base of the flower is a Woodware flower embossing punch, I added two Prima hydrangea flowers, a center sent to me by my friend Bev, a halfpearl and some leaves punched with a Martha Steward punch. The large leaves are done with SU's small Sizzit leaves. The base of my card is Su's kraft carstock. I stamped a branch of the "Thoughts and Prayers" set with Su's chocolate chip ink on it and used my white gel pen to highlight some details. All borders are distressed with my brown inkpad. Ich habe einen Stempel der deutschen Party und Geburtstagstexte von Whiff of Joy Stamps verwendet und ihn mit einem Tattered Angels Glimmer Chips chipboard eingerahmt. 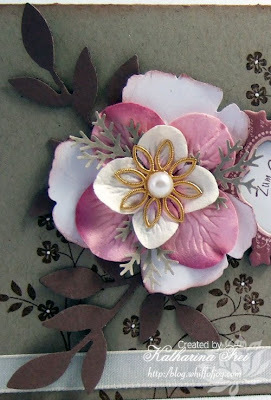 Die Basis der Blumenverzierung ist ein Woodware flower embossing punch. Ich habe zwei Prima Hydrangea flowers hinzugefügt, ein Zentrum von meiner Freundin Bev, Blätter eines Martha Steward Stanzers und eine Halbperle. Die größeren Blätter habe ich mit einem Stampin' Up Sizzit Stanzer gemacht. Die Basis meiner Karte ist Kraft cardstock von Stampin' Up. Darauf habe ich einen Ast des Su sets "Thought and Prayers" gestempelt und Details mit weißem Gel Stift hervorgehoben. Alle Kanten habe ich mit braunem Stempelkissen distressed. Love your card dear and big congrats on your GodChild!! Love this card - beautiful! I really like the pink and grey colour combo. Beautiful and so elegant!!! Your niece/godchild will treasure this in years to come. Wonderful colours and such pretty details. Congratulations it is always nice having a new baby to play with (and hand back lol). Dein Karte ist absolut bezaubernd geworden!!! Congratulations to Isabellas parents and to you for brcomomg a Godmother. The cards just gorgeous. Congrats on becoming a Godmother, that is so exciting! Lovely and elegant card, I love it! Congrats on becoming a godmother!! I luv the name Isabella! That's the name my hubby and I wanted to use for our first daughter. This is such a pretty card. I luv the stamped image. That stamp set is on my next SU purchase. cogratulations on being a godmother! the card looks fab! Congratulation on becoming a GodMother Katharina! I love this card. It's so pretty. Congratulations on becoming a Godmother! Your card is stunning and I am sure something to be treasured!!! And what a wounderful card you made! I just love that frame! 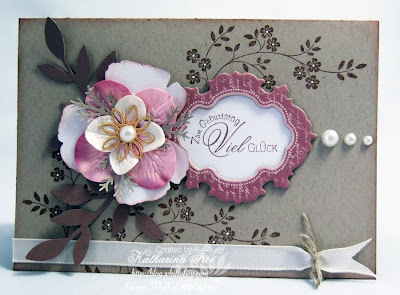 Your card is exqusite wonderful design and beautiful detail! Congratulation on your little niece and Godchild!! Love the card...wow... The colors and the details... so elegant and classic. The Chipboard frame is outstanding and so is that text too. What a lovely card you have made! Herzlichen Glückwunsch zum Patenkind und Alles Gute für die kleine Isabella und die ganze Familie! Super-elegante Karte übrigens - die strahlt so richtig "Familien-Erbstück" aus! Huge congratulations on the safe arrival of your god child/niece. A BIG congratulations to you! beacouse this is a big and beautiful thing. And wow your card....just as gorgeous as always!!! Congrats on your godchild! How exciting!!! And what a beautiful card! Love the colors and that gorgeous flower! Herzlichen Glückwunsch! ;-) Natürlich uch an die Eltern der Kleinen! Die Karte ist wie immer ein Traum!